When you're pregnant everyone tells you to "enjoy your sleep while you can!" It's hard to really get what that means until your new cute and tiny roommate shows up wanting to be held, fed, or changed around the clock. A week or so of this is doable. But many weeks and months of sleep deprivation put wear and tear on your mind and body. 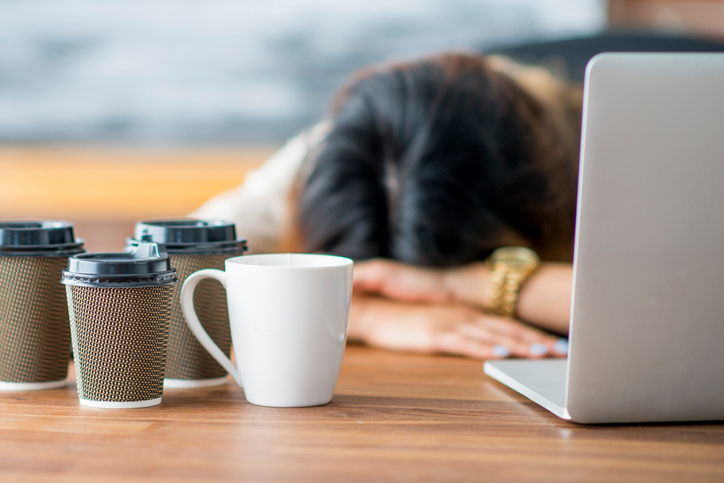 To help you keep your mood, health, and brain functions relatively intact, we've gathered tips to help you get through the roughest bits of sleeplessness. Research shows that eating protein, whole grains, and possibly fruit first thing in the morning can help your ability to function on less sleep. Try hard-boiling a batch of eggs ahead of time, prepping oatmeal you can heat up, or even just having some of last night's leftover chicken and veggies. Avoid sugar. People may say this so often to you that you don't really hear it. And what? You have thank you notes to write and laundry to do and…. zzzz. See? Try it. It may not be realistic for every nap, but as much as possible, grab a hunk of bed or sofa and snooze while that little one is conked out. It could make the difference between losing it and being excited to make goo-goo eyes at this new person. The first six weeks of your baby's life can be ecstatic, overwhelming, and exhausting. If you find you can't get any sleep, consider hiring a postpartum doula come help out a few times. (Look here to find one.) She'll answer questions and mind your wellbeing. And many do a magical thing called an "overnight." You pay her the best money ever spent to hang out with your baby while you sleep; she'll just bring him in to feed as needed. Even once in those first weeks can be a miracle. If that's outer-budget, see if you have a sainted friend with older kids or a baby-savvy grandparent to do the same. If you're breastfeeding, take it extra-easy on the caffeine, but even so, a shot of a.m. espresso or small cup of coffee can help jumpstart things (here's why). Just make sure not to have any after noon, when it could interfere with potential night sleep. Though it may seem tempting to hit life's pause button, it's actually healthier to just sleep a little later and then get up. You'll have more restorative sleep in you, even if it means skipping out on chores or shortening your beauty routine. Plenty of studies show that babies who are sleep trained (allowed to "cry it out") don't suffer any damage and may be better sleepers as adults. Choose a method based on your level of comfort with crying. You might try the "No Cry Sleep Solution" by Elizabeth Pantley if the tears make you miserable. Or try "The Sleep Easy Solution" by Jennifer Waldburger and Jill Spivack for a middle-of-the-road approach. And many parents swear by Marc Weissbluth's popular "Healthy Sleep Habits, Happy Child" book for a more cold-turkey method. Whatever you choose, be consistent and you should see results. Once baby is finally asleep it's tempting to stay up late catching up on email, chores, or settling into a little "me" or couple time. Don't do it! Or at least not too much. Chances are your baby has the biggest chunk of sleep early in the evening—ride that wave by tucking yourself in, even if it means your new bedtime for a while is 9pm. Your body and baby will thank you. Studies show that adequate hydration is essential for many body functions, including cognitive ability and energy levels. Make sure you get your daily minimum. Many experts say half your body weight in ounces (So if you weigh 140, 70 ounces will do ya.) You can measure it in water bottles—"I'll drink two of these 33-ouncers today, for example. At some point, your wee one will sleep through the night. Truth! It's not an over-the-rainbow dream. And you will eventually a solid, uninterrupted set of ZZZs—as long as your LO isn't sick, of course, or lonely, or bored. BUT, this will be the exception and the rule will be actual, real, consecutive sleep!